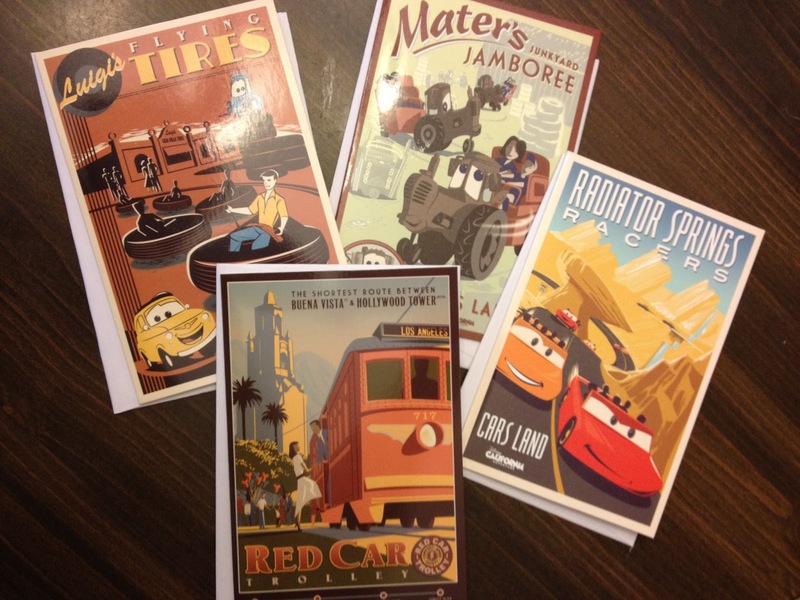 Picturing Disney: "Postcards from California Adventure" Notecard Giveaway! "Postcards from California Adventure" Notecard Giveaway! The Disney California Adventure expansion is incredibly breathtaking and deserves all of the hype it is getting. DCA held a special place in my heart when I visited last summer as it felt like it was everything I always wanted from Hollywood Studios in Disney World. Disney loves setting the bar higher and higher and the addition of Buena Vista Street and Carsland does just that! I took 100s of pictures in Disneyland this past week but I was so psyched for the expansions that I posted some pictures over on the Picturing Disney Facebook page. I also was so excited about the expansion that I brought home lots of goodies. I wanted to share something with you through a little contest. 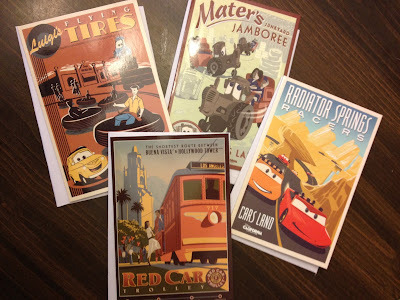 Set of 4 "Postcards from California Adventure" note cards. The picture above shows all 4 together and below I snapped some individual pics (sorry for the low quality, I used my cell phone)! These are awesome and I plan to hang a set up in my Disney kitchen. The Red Car Trolley one is especially awesome (and Buena Vista Street is my new favorite place in the park-- maybe in all the Disney Pakrs I've visited)! Simply head over to the Picturing Disney Facebook page and check out the Buena Vista Street and Carsland albums. YOU WILL RECEIVE ONE ENTRY FOR EACH TIME YOU LIKE, COMMENT, OR SHARE ONE OF THE PICTURES FROM THESE TWO ALBUMS! I think this is a fun way for me to see my pictures shared and for you guys to win some awesome artistic note cards! You will have until Midnight Thursday July 5th to enter!